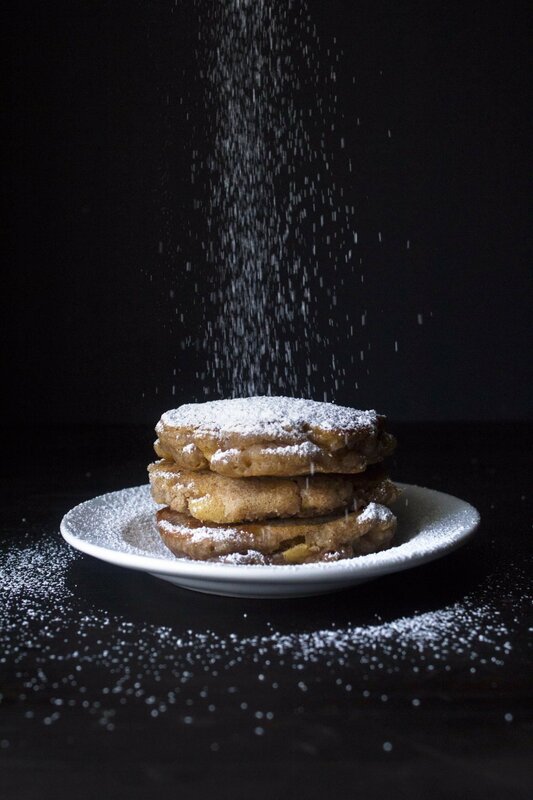 Fluffy pumpkin spice pancakes with a yummy pumpkin maple syrup, perfect for any fall morning. Gluten, dairy, egg, and refined sugar free! It’s the first day of fall! I honestly was hoping to walk outside and feel a difference. Maybe some beautiful fallen leaves waiting for me on the porch or a gentle nip in the air. But, being in the south, fall seems to take its sweet time getting here. Like that one friend who’s perpetually late to everything, it seems like fall has done it again this year. It’s a humid 81 degrees and sunny with a zero percent chance of fall weather today. The slight reddish-yellow tinge on the tree’s leaves is the only sign that a change is coming. But, that doesn’t deter me from celebrating the change of seasons! I look forward to each season like a kid anticipates Christmas. Each season brings something new; a holiday, a loved one’s birthday, a change in weather, etc. It’s a change in scenery for a girl who gets bored easily. By the end of summer I’m pretty much ready for the cooler weather. Does anyone else look forward to wearing sweaters and boots for a change?! I’d like to mark the beginning of autumn by making something with my favorite fall flavor—PUMPKIN! Here’s a delicious recipe for Vegan Pumpkin Spice Pancakes! 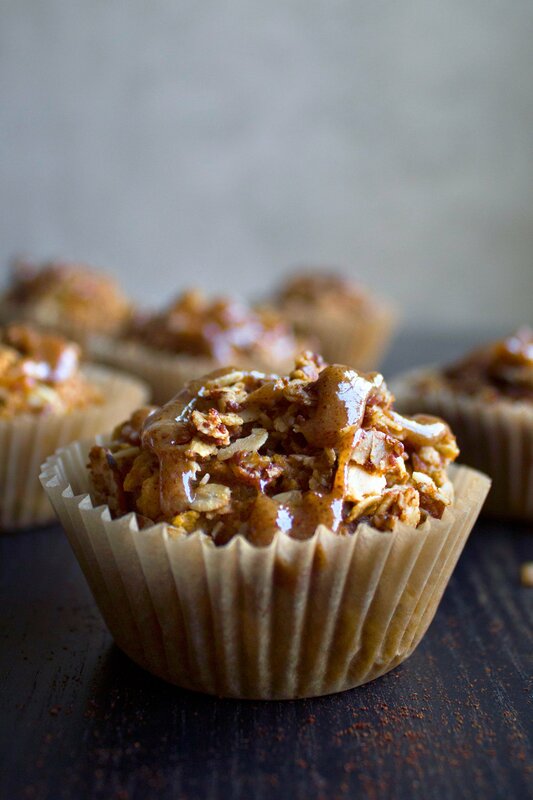 They’re gluten, dairy, egg, and refined sugar free, but yet so fluffy and delicious! You definitely can’t tell these are made with healthier ingredients. I pour the batter by the 1/4 cupfuls onto a hot, greased pan. The batter is pretty thick so just be sure to cook them at a lower temperature so they cook well on the inside. Flip them when bubbles begin to appear around the edges. I’ve been cooking pancakes in my new cast-iron skillet , which I think cooks them perfectly. How I’ve managed to live this long without one, I have no clue! The next piece I’m eying is the cast iron grill/griddle combo for the stovetop. I topped my pancakes with a little Earth Balance butter and some pure maple syrup. This, along with some cinnamon spiced coffee, made for a perfectly fall-ish breakfast! 2 tablespoons melted coconut oil or butter. In a large bowl, whisk together flour, flax meal, baking powder, pumpkin pie spice, and salt. Add the maple syrup, milk, pumpkin puree and mix until combined. Stir in the coconut oil until fully incorporated. Lightly grease a pan or griddle with coconut oil or dairy-free butter. Pour batter by the ¼ cupfuls onto a pan over medium-low heat. Flip when bubbles begin to appear around the edges. Because the batter is thick, the pancakes can easily look done on the outside without thoroughly cooking on the inside. Check to make sure the inside is fully cooked before removing from the pan. If the pancakes begin to get too brown, lower the temperature. Pumpkin Maple Syrup—Melt butter in a small saucepan over medium heat. Stir in pumpkin puree and cook slightly until mixture is smooth and bubbly. Stir in ½ cup maple syrup, pumpkin spice, and vanilla extract. Cook until mixture is smooth and thoroughly heated. Add additional ¼ cup of maple syrup if you want it thinner. Serve warm. Refrigerate any leftovers in an airtight container for 4-5 days. We love breakfast for dinner..it’s my favorite meal of the day:) Thank you for your comment, Kristine! Glad your family enjoyed these! The best pumpkin pancake recipe there is! I do not typically carry these ingredients in my pantry but definitely worth the investment because I will make these again and again! Thank you! Thank you, Jackie! These are my family’s favorite pancakes as well:) I’m so glad you liked them! Have never used tapioca flour before! The fluffiness of those pancakes have convinced me I need to try. Also, that pour shot of that maple syrup has me feeling all warm and cozy inside. Thanks for sharing! sounds delicious Joscelyn!! love your pictures!! it does not feel like fall here in California as well, but atleast it was a little bit nippy in the morning! Well days will certainly be shorter now 🙂 I had made pumpkin bread last year with chocolate chips and a cream cheese frosting!! Thank you so much, my friend! I think I could get over not having fall weather if I got to live in sunny California! I LOVE the pumpkin and cream cheese combination! I’ll bet chocolate is really delicious with that as well:) Have you ever made a pumpkin jam/butter before Amisha? No! never tried pumpkin jam before ! I tried persimmon last year, and failed miserably! lol I had to throw it all away. I love persimmons. I think pumpkin butter will taste really good! with some good raisin bread! yummm. I am going to try your Chia pudding tonight. I have almond milk, don’t have chocolate. I think I will add raw cacao to it and try it. Do your kids like it? Oh no! That’s too bad that your persimmon jam didn’t turn out:( That sounds like it would have been so yummy too..
My kids do like chia pudding! They like to eat it with fruit, like a parfait. Let me know how yours turns out with the cacao.. I haven’t tried it that way before! I tried it and it was lovely!!! I had it for breakfast.. hehe. I tagged you and your recipe on IG 🙂 dear friend!